Little Szechuan put Sichuan food in Minnesota on the map a little less than a decade ago. From the original location on University Avenue in Saint Paul they expanded first to the tony West End mall in St. Louis Park and then later to the university area in Minneapolis. By the time of their expansion, however, they were no longer the best Sichuan food in town. That torch had been taken by their original chef to his new restaurant Grand Szechuan in Bloomington—and he’s pretty much held it there since then. I’ve noted before that I’ve found the quality at Little Szechuan to be highly variable since Chef Luo left—and I’m not sure how much stability there has been in the kitchen. Our experiences, at any rate, have been very up and down in the last few years. Their menu makeover from a couple of years ago seems to have been designed to maintain a separate identity from Grand Szechuan, and while they have some intriguing dishes that are unique to them (in town) the execution has not always been top notch. And that seems to go double for the shiny outpost in St. Louis Park where we had a ho-hum meal a couple of weeks ago. I’ll be reporting on that meal later this month but here first is a review of the original location of Little Szechuan, which closed on April 1 for what was promised to be four weeks of remodeling and, as often happens, turned out to be two and a half months. More surprisingly, the week before they opened they tweeted an announcement that they would be re-opening on Saturday, July 14 as a dedicated Sichuan hot pot restaurant. You’re probably thinking, “What better way to celebrate Father’s Day?”. Yes, that’s what we thought as well. As it turned out they did not in fact open on July 14, but instead on Father’s Day itself. Now, let me say first of all, that while I am anything but a professional reviewer I would not report on a bad experience at a restaurant in its first week or month of operation, let alone on the first morning. So you should know out of the gate that this was a good meal. Normally, I wouldn’t even eat at a restaurant in its first month of operation, giving them time to find their legs. But hot pot is not a complicated thing: all the kitchen really has to prepare are a number of broths/soup bases. There were a couple of logistical hiccups at our meal, but I’m not even going to bother noting them—it would be surprising if there weren’t any. We’ll go back in a month or two and if the problems persist I’ll bring them up then. In the meantime I do want to help get the word out (see below). They’re all in on the hot pot—there is nothing else on the menu and it is an extensive remodel with every table outfitted with built-in burners (induction probably), which the owner said were imported from China. If you haven’t eaten Sichuan hot pot before, it’s a pretty simple thing that nonetheless seems daunting because you may not always be sure what to do. Here is what you do: you order a soup base (or a few) and you order a number of things to dip in the soup base: meats, mushrooms, seafood, noodles, vegetables. All of these will come out raw. While you’re waiting for them to come out you get a bunch of condiments from the condiment station. Each person should at least get a bowl with some sesame oil in it. When the soup/broth arrives it will be placed on a burner on your table which will start heating it up–once it’s started bubbling you drop in the cold stuff, let it cook and then you pick out what you want with chopsticks, dip it into the sesame oil and whatever other condiment you like and eat. You don’t want to eat straight out of the hot pot both because it will be very hot, and because you want to let the chilli oil drip off as much as possible (this part does not apply for the mild “white” broth). It’s probably best to put the meats in first as they will further flavour the soup that will coat the subsequent ingredients. There are about five or six soup bases available at Little Szechuan right now and they can be got either family sized or in smaller individual bowls. At the spicy end of things there’s a simple spicy broth and there’s a spicy broth with the ma la (numbing) flavour of Sichuan peppercorns. If you order the “Hot and Fresh” you’ll get a divided pot with spicy broth (you can ask for the ma la version or not) on one side and a mild bone broth on the other side. There’s also a fish and pickled vegetable broth (mildly spicy, apparently), a seafood broth and a mushroom broth—these come with fish, seafood and mushrooms respectively already in them. There’s a far wider range of things available to put into the hot pot(s). The broths are topped up as needed as the meal goes on. If you get the mild soup/broth you can eat it as soup at the very end (say with noodles); but you should not do that with the spicy broth as there is an unfeasible amount of chilli oil in it. There were four adults in our group and our two boys and so we ordered a large “Hot and Fresh” pot with the ma la broth for the spicy part. We got a raw seafood platter (it came with crab, mussels, clams, octopus and squid), a mushroom platter (with a wide range of mushrooms in it), a whole bunch of meats, and a couple of types of noodles. At the condiment station, stocking up as we wait for everything to arrive. Condiments. Everything is labelled clearly at the station so there’s no risk of confusion. Here we have a couple of types of chilli sauce, chilli paste, barbecue sauce, sesame paste, cilantro/green onions and crushed garlic. ere is our Hot and Fresh pot as it came out of the kitchen and placed on the burner. I hope you can see from this why you should not plan to eat the chilli broth at the end of the meal. I think the chilli broth here has fresh rather than dried Sichuan peppercorns at the bottom. Our hot pot on the go. The broths were very good and it was a very enjoyable meal. All of this came to about $100 before tip. I will note that hot pot anywhere can be tricky if, as we did, you have people in your party who are not adept with chopsticks–they’ll need to have things fished out for them which kind of breaks the flow and makes it hard for them to dip things in condiments with forks. Luckily, our non-chopstick adept people (my parents) are very adventurous eaters–if you go with people who are not then getting one large pot for the entire table may be iffy as everything goes in the same broths. The potential problem with Little Szechuan’s set up is that the tables that can seat more than six people are only enabled for a single central burner (at the circular tables) or with two burners (at the rectangular tables). The booths are set up with four individual burners and one central burner at each table but can only comfortably seat four people. So, if you’re going with finicky people who might need their own setup it’ll be a little awkward if there are more than four of you and the finicky or the non-meat eaters object to your beef tripe going in the same broth as their enoki mushrooms and watercress. (Having said that, I’m not sure that any of the broths are strictly speaking vegetarian but I don’t want to misrepresent the restaurant.) But if you’re going with a large group of gung ho people get a large table and think about this no more. And I do hope large numbers of people will go as word gets out. They’ve taken a very bold step in making this hot pot only. There are, of course, many such places in the greater Los Angeles area and in New York but, as I’ve noted before, the far fewer Sichuan restaurants in the Twin Cities are pretty reliant on a clientele that orders predominantly American Chinese food (Grand Szechuan has hot pot too but not every day). And even for many of those who eat the Sichuan stuff this is a very new idea. On Sunday they lost a number of customers who’d come for the regular menu and did not want to try the hot pot (it may not have helped that at the door they were describing hot pot as like fondue–which I guess is broadly accurate). 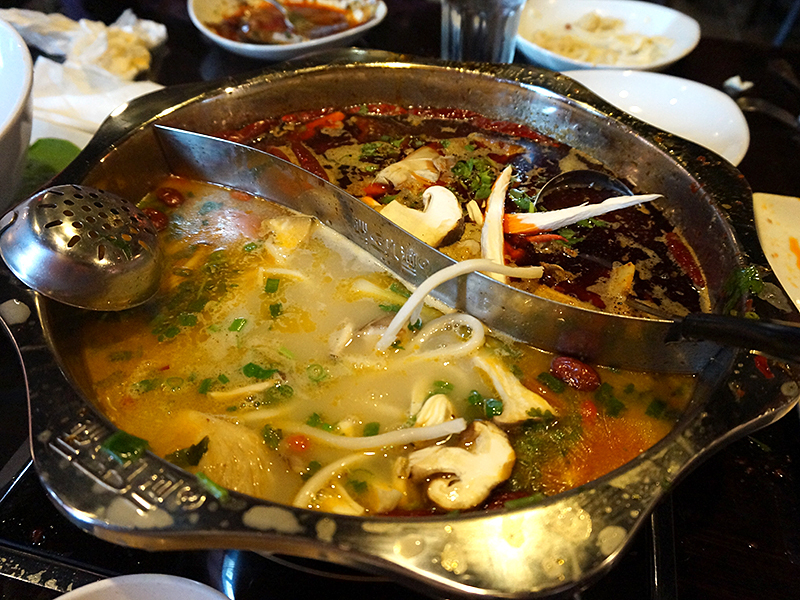 Will the Twin Cities be able to sustain a dedicated hot pot restaurant? I hope so but I won’t be surprised if they end up supplementing the hot pot menu with some other cooked dishes sooner rather than later. In the meantime, do your bit and go! This entry was posted in *Food, Minnesota and tagged Chinese Cuisine, Hot Pot, Little Szechuan, Sichuan, Twin Cities Chinese. Bookmark the permalink. And it seems that some of their old clientele is already pressuring them to bring the regular menu back. See comments on the restaurant’s website here. This review in City Pages says something about the context for Sichuan food in Minnesota: ma la broth to be cut with sweet and sour sauce, unpalatable ingredients, anticipating disappointment at the broccoli being Chinese etc..